The strike by the civil servants comes a month after clashes between protesters and police following the self-immolation of a journalist. The Tunisian General Labour Union (UGTT) took out a countrywide strike of public servants to protest the government’s austerity law. The strike was called on January 16, after negotiations between the government and UGTT over the increase of wages for government employees failed. Tunisia is currently on the verge of an economic crisis. It has witnessed a rapid ballooning of public debt and unemployment since the country’s transition from an autocratic polity to a multiparty democracy in 2011. The Tunisian government is under pressure from the International Monetary Fund (IMF) to take up austerity measures to balance its public debt crisis. The successive governments that came to power in the aftermath of the Arab Spring, which saw the fall of the 29-year-long autocratic rule of President Zine El Abidine Ben Ali, have struggled to manage the economy. The national debt has increased from less than 40% of the GDP in 2010 to over 70% by 2017, while growth has slowed down and stagnated at 1%. While the situation improved in 2017-2018, when the growth rate increased to 2.1%, very little was achieved in terms of employment generation. The unemployment rate is currently at 15% with youth unemployment estimated to be over 25%. In 2018, the current Nidaa Tounes-led coalition government introduced the New Finance Bill under pressure from the IMF. The law laid out institutional frameworks for austerity measures to manage the national debt, which included freezing current wages of the government employees and raising taxes on goods and services, which in turn raised the cost of living. These measures were met with a month-long protest by the workers and youth across the country, supported by the leftist Popular Front. “Tunisia is now going through one of its hardest of times, affecting people from all walks of life… all because of the government’s anti-national and anti-people policies as well as its dependence on the global financial services, in particular the World Bank and the International Monetary Fund” Saidi added. The organizing of protests by the UGTT is quite significant for the future of popular mobilizations in Tunisia. Apart from being the largest trade union in the country, with over half a million members, UGTT played a crucial role in the overthrow of the Ben Ali government and in finding a solution to the political discord between Islamists and secularists that followed. In the current political climate, apart from the Popular Front, UGTT is the only national organization channelling people’s discontent against the government. As the present coalition government enters its last year in power, it has been greeted by protests and demonstrations. As the anger against the government gets increasingly organized by trade unions and left movements, it is likely that the upcoming general elections, likely to be held between October and December, will be quite vital in Tunisian history. 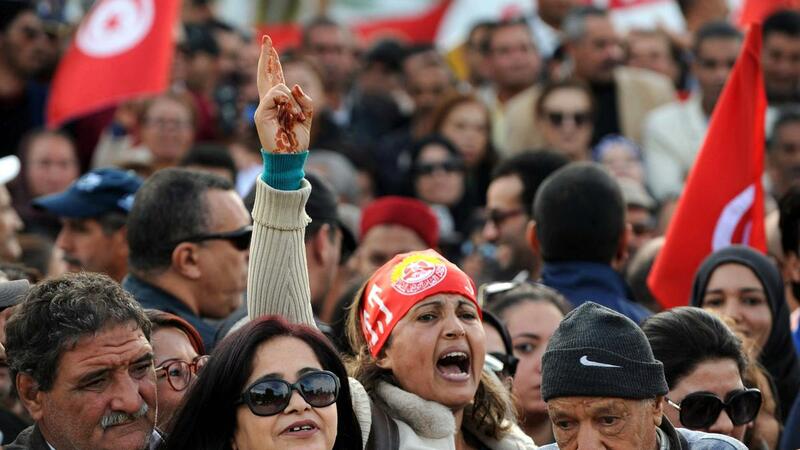 Hey Buddy!, I found this information for you: "Tunisian civil servants take to the streets against austerity regime". Here is the website link: https://peoplesdispatch.org/2019/01/19/tunisian-civil-servants-take-to-the-streets-against-austerity-regime/. Thank you.